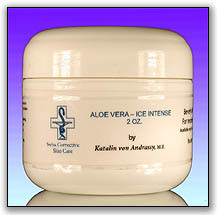 A gel concentrated with Aloe Vera to work as a mild sedating, hydrating and calming agent. May be used on irritation and allergies. Apply a thin coat to the desired area after cleansing. Deionized Water, Aloe Vera (BM), Butylene Glycol, Carbomer 940, TEA, Panthenol, Allantoin, Diazolidinyl Urea, Methylparaben, DMDM Hydantoin, Cucumber Extract.